Most notably, it is the first show in CN’s 20 year history to be created and overseen by a woman. Rebecca Sugar is a writer, artist, and songwriter who grew up creating and drawing comics with her friends and younger brother, for whom the series is named. At 26, she was named one of Forbes’ “30 Under 30 in Entertainment.” She is best known for writing on CN’s hit show Adventure Time, and is responsible for many of the show’s most popular episodes. She has also written and drawn several independent comics, like Pug Davis. 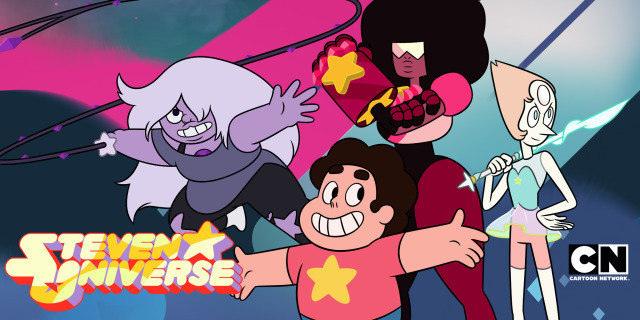 The show itself is about a young boy growing up while trying to emulate and become just like the other Crystal Gems. There has been some concern over the show’s central character not being female. However, not only does the show provide plenty of awesome female role models and characters, but it also teaches young boys that they can openly look up to and desire to be more like the women in their lives. This is discussed more thoroughly and eloquently here. Unlike most other CN shows (or TV shows for children in general), the SU cast is predominantly female. 3/4 of the Crystal Gems are women, and they are presented as Steven’s primary role models. CN has a pretty crappy history of not wanting female characters represented prominently or positively in their programming. This show is a pretty big step up for CN, hopefully this may help change their policies in the future. The story is sweet and adorable and full of heart and humor, with a nice splash of nostalgia for 90s video games like Legend of Zelda and Final Fantasy. The artwork is stunning and the animation is top-notch, reminiscent of Miyazaki and Tartakovsky. It’s just a whole lot of fun. Also the music is phenomenal. Fortunately, Steven Universe has been renewed for a second season, but that doesn’t mean that the show is safe from cancellation or that CN has learned anything. Check it out, support the show, and maybe just maybe there will be plenty of shows like it in the future. New episodes air on Thursdays at 6:30pm. YES, YES, YES, LOVE THIS, LOVE THE SHOW, LOVE THE MUSIC! YES! I think the music is my favorite part, honestly.